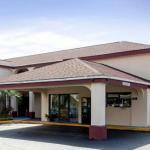 Free Wi-Fi an outdoor pool and lots of free parking complement free breakfast and value-friendly rates at Americas Best Value Inn Sumter. This two-story hotel offers 49 rooms with free Wi-Fi microwaves mini-fridges local calls and ironing facilities. Enjoy your favorite show on HBO or catch up on work at the desk. Fuel up for the day head with free continental breakfast and lots of fresh hot java and in the summertime go for a splash in the outdoor pool. The hotel offers free parking. This hotel is off Highway 521 between Sumter and Danzell. Stock up on supplies at the grocery store next door and find your new favorite hangout at several restaurants within two miles. Go shopping at the Sumter Mall three miles south or visit family at Shaw Air Force Base seven miles west. University of South Carolina Sumter is five miles south. Columbia Metropolitan Airport is 47 miles west.